Johnson Suisse (Malaysia) Sdn Bhd started operations in Malaysia in 1964. Today, JohnsonSuisse has one of the most modern ceramic sanitaryware factories in the region, and is recognized as the largest sanitaryware manufacturer in the local market, with a leading brand name and market position. Its brand has become the reference for consumers and professionals in Malaysia and Singapore, and its products are specified in prestigious hotel and housing projects in Hong Kong, China and Sri Lanka, amongst others. 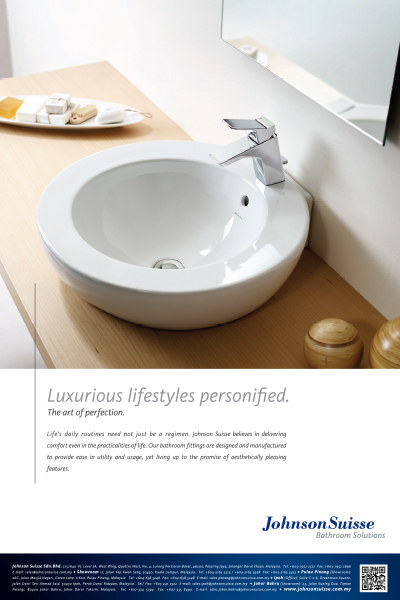 JohnsonSuisse’s bathroom solutions are marketed through a network of local distributors. Sizeable portions of the Company’s products are exported to Italy, Germany, China, Brunei, Hong Kong, Taiwan, Singapore, Australia, New Zealand and Sri Lanka. With a strong history and skilled expertise in sanitaryware, JohnsonSuisse has established itself as a major player in the sanitaryware industry in Malaysia and Singapore. The Company constantly strives to set high standards for itself and is committed to maintaining its position as an industry and market leader to take the Company to the next level of excellence. With the acquisition by Spanish-based sanitaryware expert in 2006, ROCA further solidifies its leading brand position in the region and provides a strategic platform to enhance and strengthen the JohnsonSuisse brand name and its presence both locally and internationally.